What are Bearing and BearingTol fields? The direction in which a vehicle is moving can serve as a clue to better locate it on a network. The graphics below illustrate this principle. Without bearing information, it is hard to tell which street the vehicle is on. It could be on either the north–south or east–west street. It becomes clear that the vehicle is heading north on the north–south street when the bearing information is included. The ArcGIS Network Analyst extension makes it possible to use this principle to more accurately locate points on a network dataset. GPS devices often calculate bearing in addition to current geographic location. Many network analysis classes have Bearing and BearingTol fields so you can use bearing information when loading moving points. Doing so results in more accurately placed network analysis objects. Also, this helps prevent driver confusion because the routes and directions that you generate from these moving points are likely to start from the correct location. It is common, for instance, to send a truck's current location and bearing via a mobile phone equipped with a GPS receiver to ArcGIS Server where the information is loaded as the first stop in a route analysis. Other stops the truck hasn't visited yet are loaded as well, the route is solved, and the results and directions are sent back to the driver's phone. Using the bearing information during this process helps prevent the truck from starting its route on the wrong street when the truck happens to be near an intersection or an overpass. It also helps the ArcGIS Network Analyst extension verify the direction in which the vehicle is traveling so that the start of the resulting route matches the direction the vehicle is currently traveling in. To locate moving points with bearing data, simply load the points using the Add Locations geoprocessing tool, for instance, and map bearing and bearing tolerance values of your input points to the Bearing and BearingTol fields, respectively, of your target network analysis class. The Bearing and BearingTol fields are described below. Bearing—The direction the vehicle or person is moving in. Bearing must be in degrees and is measured in a clockwise fashion from true north. Typically, values are between 0 and 360; however, Network Analyst also interprets negative values simply by subtracting them from 360 degrees. BearingTol—Short for bearing tolerance, this field is where you specify the maximum acceptable difference between the heading of a vehicle and a tangent line from the point on a street where Network Analyst attempts to locate the vehicle. In other words, the bearing tolerance is used to determine whether the direction in which a vehicle is moving generally aligns with the underlying road. 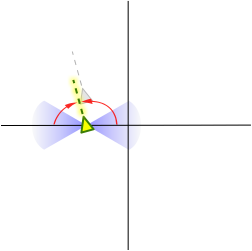 If they align within the given tolerance, the vehicle is located on that edge; if not, the next nearest eligible edge is evaluated. The BearingTol units are degrees, and the default value is 30. You can choose any tolerance that is greater than 0 and less than 180. Network Analyst snaps the point to the nearest edge. The bearing tolerance is calculated from the point on the nearest edge to set the minimum and maximum bearing values. This is done for both directions of travel. The bearing of the point you are adding is compared with the minimum and maximum allowable bearing values for each of the two travel directions. If the bearing falls within the tolerance, the point is added there as a network location. The direction of travel on the road is also determined—it matches the direction of the bearing tolerance that the bearing falls within. If the bearing falls outside the tolerance, the point isn't located, and the bearing tolerance of the next nearest eligible edge is evaluated. (Some edges may be ineligible for other reasons; for instance, you could have chosen not to locate on restricted elements or to exclude all highways. In this case, all edges that are prohibited or highways would be skipped.) This process repeats until the point is located on a suitable edge or the point is left unlocated after exceeding the snap tolerance of the network analysis layer. The series of graphics below and accompanying captions illustrate how Network Analyst processes the Bearing and BearingTol fields. 1. 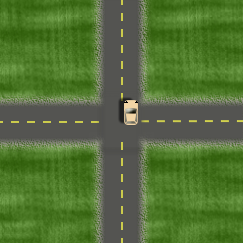 A vehicle with a GPS receiver on a mobile phone travels north through a four-way intersection and sends its current location and bearing to ArcGIS Server running the Network extension. 2. 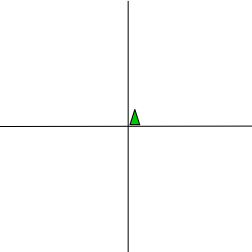 The black lines represent network edges. 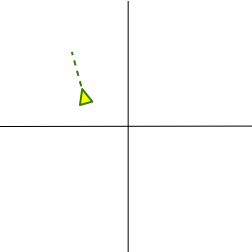 The triangle and the dashed line represent the location and bearing of the vehicle as recorded by the GPS receiver. Note that the captured location is rather inaccurate, possibly due to inaccuracies of the GPS receiver, inaccuracies of the digitized streets, or both. The GPS receiver also indicates the bearing is about 345º, which is slightly incorrect too; it should be 0º since the vehicle is traveling north. 3. 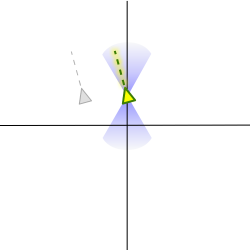 The point is snapped to the nearest edge, and compared with the bearing tolerance, which is represented by the blue gradients in this example. The BearingTol value is 30, so the tolerance spans 15 degrees to either side of the edge in both the east and west directions. The red arrows are added to emphasize the bearing is more than 15 degrees from the edge in both directions. Since the bearing falls outside the tolerance, the point isn't located on this edge. 4. The point is snapped to the next-nearest edge and loaded as a network location there since the bearing falls inside the bearing tolerance. Also, the Network extension knows the object is going north since the bearing falls within the north-facing bearing tolerance. The values that are mapped to the Bearing and BearingTol fields must have a data type of short, long, or double. If the mapped input field values for a point are null, the point is located the standard way, that is, without regard to bearing and bearing tolerance. What are network analysis objects?